25% discount on summer car rentals! Zagreb, Croatia's capital is the main entry point into the country. You'll find plenty of flights to Zagreb from all European capitals run by Croatia Airlines the national carrier, as well as other airlines. Year-round there's a London-Heathrow to Zagreb flight by British Airways. Lately more air routes to Croatia have been opening up and there are good deals on direct flights to other Croatian gateway cities such as Dubrovnik, Pula, Split and Zadar as well as flights to Zagreb. In a first, there are now direct flights to Brac island. 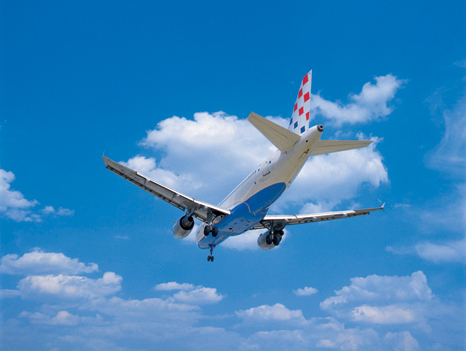 Low-cost carriers Ryanair, Eurowings, Volotea and Easyjet have introduced many summer flights to Croatia. Easyjet will also connect Dubrovnik with Naples, Toulouse, Milan, Geneva, Basel, Paris, London (Gatwick, Stansted), Bristol, Manchester, Belfast, Edinburgh and Amsterdam. Easyjet will connect Pula with London (Gatwick), Bristol, Paris and Berlin. Notice that the only direct flights from North America are Philadelphia to Dubrovnik with American Airlines; Toronto to Zagreb with Air Canada Rouge; Toronto to Split with Air Transat. Otherwise, the best deals on a round trip flight to Zagreb will involve at least one change in Europe. You may be tempted to fly to London to take advantage of a cheap fare to the Croatian coast. Be aware that some low-cost airlines to Croatia are not flying out of international airports such as Heathrow or Gatwick but use the local airports, Stansted, City or Luton. Note that these flights may not be daily and end at some point in the fall.